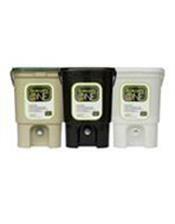 Bokashi Compost Bucket and 1kg of EM - Our Price $89.95 - Save $20.95! Reduces the need for an outside compost pile and is easier to maintain than a worm farm. The bucket is 410mm high, 310mm wide and 300mm deep, stores neatly under kitchen sink. The Bokashi Bucket can hold approximately 19 litres of food waste, perfect for any size house hold. Ensure an ideal environment for anaerobic fermentation to take place, while controlling odours and deterring flies. Placing the plastic gate inside the bucket and then piling food waste on top of it separates the food waste from the liquid that accumulates at the bottom of the bucket. This liquid can be easily drained through the tap and used as a nutrient-rich fertiliser for the garden. Bokashi is a Japanese term that means ‘fermented organic matter’. EM Bokashi is a pleasant smelling product made using a combination of sawdust and bran that has been infused with Effective Micro-organisms (EM). EM Bokashi has traditionally been used to increase the microbial diversity and activity in soils and to supply nutrients to plants. EM is a mixed culture of beneficial naturally occurring micro-organisms, mainly lactic acid bacteria, yeasts, photosynthetic bacteria and actinomycetes. All of these are mutually compatible and coexist in a liquid culture. The key to the success of this system is the specifically designed Bokashi Bucket, and the use of EM Bokashi. Bokashi is a Japanese term that means “fermented organic matter. EM Bokashi is a pleasant smelling product made using a combination of sawdust and bran that has been infused with Effective Micro-organisms (EM). EM Bokashi has traditionally been used to increase the microbial diversity and activity in soils and to supply nutrients to plants. Place your kitchen waste into the bucket, then sprinkle a hand full of EM Bokashi over the waste. Repeat this layering process until the Bokashi Bucket is full. Drain off liquid (Bokashi juice) as necessary. Once the bucket is full to capacity, the waste can be buried. If you have two Bokashi Buckets, begin the process again in your second bucket. Let the waste from the first Bokashi Bucket continue to ferment for 10-14 days or for any additional length of time. Then, bury the waste and wash out Bokashi Bucket ready to use when your second Bokashi Bucket is full. If you have only one Bokashi Bucket the waste can be buried as soon as it is full, obviously the waste on the top has not had much or any chance to ferment, even so, the waste will still break down quickly because of the micro-organisms mixed in. With two Bokashi Buckets the waste gets extra time to ferment, you will get more of the valuable Bokashi Juice and it is more convenient, however, this wonderful composting system will still work with just one Bokashi Bucket. Bokashi Compost will look different to other compost that has decayed. As the food waste does not breakdown or decompose while it is in the bucket, much of its original physical property will remain and it will have a pickled appearance. Breakdown of waste will occur after it has been transferred to the soil. WOTNOT Biodegradable Baby Wipes - 12 pack - Save $13.90 on single pack price! MOLTEX Eco MAXI (Size 4) nappies - 5 packs for $99.95 (RRP $129.95) Save $30!